Angela Newton, Lincolnshire County Council member for Spalding West. Lincolnshire’s media has been awash in recent days with talk of a possible change in the way public services are run across the county. The prospect of all seven borough and district councils in Boston, East Lindsay, Lincoln City, North Kesteven, South Kesteven, South Holland and West Lindsay, disappearing from the political landscape has become a live issue after the revelation that talks were under way to reform local government in Lincolnshire. Martin Hill, leader of Lincolnshire County Council. But the truth is that newspapers, radio and TV stations in the county are three months late in joining the debate on one council for Lincolnshire versus closer working and collaboration. On February 20, Lincolnshire County Council passed a motion from Wainfleet and Burgh Independence from Europe councillor Chris Pain for a “Task and Finish Group to look closely at the potential benefits, risks, costs and savings from having unitary status for our county”. In his motion, Coun Pain said: “Lincolnshire County Council, in common with other parts of the public sector, is faced with continuing reductions in funding – with increased demands on many services. “We must explore options that maximise (the) impact on finances, whilst minimising (an) adverse impact on the people we all serve. Sarah Dodds, Lincolnshire County Council member for Louth North. In its report called As Tiers Go By: A Collaborative Future for Counties and Districts, the New Local Government Network published average figures from seven shire councils which showed savings of between £14 million and £38 million after adopting unitary status. In its truest form, a move to unitary government in Lincolnshire would see county, district and borough councils replaced by either one single council or either two or three larger, regional council, providing public services such as waste collection, roads maintenance and libraries for the county. 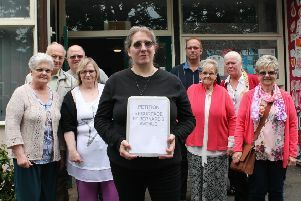 Angela Newton, county councillor for Spalding West and district councillor for Spalding Monks House, said: “I believe it is time to look at who does what in local government. John Hayes MP and Minister of State for Security. Photo by Tim Wilson. “Our residents don’t always know if the matters they raise are a district or county council matter. “All they do care about is that the council, whatever the make-up of it is, deals with their request or problem as soon as possible. The future of local government in Lincolnshire was put firmly in the spotlight by county council leader Martin Hill who, at a county council meeting on Friday, persuaded colleagues to back a motion for the Task and Finish Group’s remit to also include taking on greater powers from Westminster. Greg Clark MP, Secretary of State for Communities and Local Government. These could include managing bus franchises and operators, running further education colleges, taking greater responsibility for the roads network and even commission major housing developments. In his annual Leader’s Statement published on Friday, Coun Hill said: “Counties are determined to cut the complexity and cost of public services, moving towards a joined-up, ‘One Place, One Budget” approach. “What we do want is to move rapidly towards combined, more responsive, county-led authorities in areas such as Lincolnshire. But support for a One Lincolnshire council is far from universal or merely split along party political lines. In fact, Conservative MP for South Holland and The Deepings, John Hayes, said: “My own view is that I’d want a lot of convincing about whether (unitary) would work. “Power is best exercised as close to the people as possible and as close to its effect as possible. In essence, the debate about the future of local government in Lincolnshire is best summed up by Sarah Dodds, Labour county councillor for Louth North, who said at Friday’s meeting: “the devil is in the detail”.